I joke a lot about my yarn-hoarding. I’m half-kidding and half…not. I really do become very territorial about my yarn stash. Even with yarn that isn’t really mine; yarn someone gives me for my charity knitting, or yarn someone buys so I can make them something, yarn that I know full well I have no true ownership of – while it is yarn in my house, I protect it like a mother bear protects her cubs. But oddly, once I’ve made something with it, my ownership issues abruptly end. I suffer no pain while boxing up the little sweaters and booties – even though I about chewed off my own child’s hand for daring to suggest that it would be good for her finger-weaving. Even if I loved the project so much while I was doing it that I about took it to bed with me at night. Once the last end has been run in, that’s it. It goes on to wherever it really belongs. I set it free with a happy heart and don’t dwell on it. It is an odd quirk of mine, I guess. I do the same thing with projects at work – I am extremely territorial over things I am currently working on, but once they leave my desk I really don’t care all that much what happens to them next. Also, I forget how they work with shocking speed. So you can imagine how I feel when someone calls me up to discuss analysis that was done this time last year…now, about column K, how did you derive that? I especially hate it when I’m on the phone for these conversations. I sound much dumber ‘live’ than I do in email. In email, I can sound semi-intelligent, mostly because I have a filing system that is rather god-like and I can look up just about anything I’ve ever done while working for this client. But, on the phone? My current project is a set of fingerless mitts from Accessory Patterns Fall 2006 Collection from Tahki, which I’m doing in a juicy purple Karabella Aurora 8 – an extrafine merino. At $9.50 a ball, it isn’t stuff I ordinarily buy. Not even for a small project like this one. And I didn’t buy this, either. 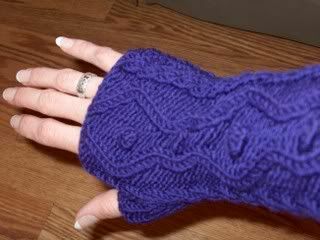 A friend bought it, and the pattern book, so I could make these fingerless mitts for her. Oh my dog, people, this stuff is fiber gold. It is soft, and warm, and yummy. The color is so rich and vibrant that my digital camera locks up and refuses to reflect the true glory – it keeps trying to make this rich, deep, eggplant-y purple pastel blue. Which irks me no end. Because it is not pastel blue. It is an incredible purple. It knits like butter, only without the greasy part. These really are cool. Fast to knit, gorgeous color, and not too many bobbles (bobbles, me no like-ee) (they’re OK as a finished product, but I find them something of a pain to make – not ‘hard’, just ‘twitchy’). The pattern is quick to memorize, and I was able to keep knitting through all crises yesterday – and believe me, there were a few. These come clear up to my elbow, and ooooooooh baby, they are warm. I’m very, very fond of this project. I love this yarn. I would like to stuff my pillow with this yarn. And also, if someone were to break into this house I would be throwing $2800 laptops at them in an effort to protect this yarn. But I know that once they’re done, I won’t have any problem with sending them off to my friend. Because that’s just how I am. You know, odd. Yup. That's just how I am. Don't worry, it's not odd. I swear! I have become quite attached to my yarn as well, but I'm having to get over that. I actually started selling a bit of it on the Yahoo Destash group. I had a few items that I didn't care for that I got in my WEBS Grab Bags, and also some needles that I hated that I purchased when I was a brand new knitter and didn't know what I liked working with. It was very hard to send off these items, but then I got to go to eBay and order yarn I really wanted. And somehow, I still miss that Jaeger Trinity, even though I couldn't knit with it if you paid me. Oh, forget the how do you do it (raise 4 kids) question. I've got a better one: how do you KNIT so prolifically with a full time job and 4 children? I love that 'spo-sta be eggplant yarn. Can feel the yumminess through the wonders of digital photography, even if it is crap at color reproduction. Those are awesome! I brougth a bunch of fingerless gloves back from Peru for the kids (or the grown ups as I now think of them) and they were a HUGE hit. I wish I could knit. Really. I'm hopeless, though. I wish I type, too. Mother of Chaos.... You ROCK! I cannot wait to wear them! Next winter I will be freezing less because of you!